Sorry today’s cookie is a bit late, but it’s a good one – especially around this time of year when everyone’s trying to eat healthier. This is a relatively nutritious, simple small batch recipe that requires only two bowls and a spoon. This isn’t a low fat cookie, but it’s high in protein so if you’re a person who eats cookies for lunch or breakfast or likes to have protein incorporated into snacks, this recipe should come in handy. According to Mastercook, each cookie (about 1.2 oz each) has 148 Calories; 8g Fat, 4g Protein; 17g Carbohydrate; 2g Dietary Fiber. And if you use Smart Balance peanut butter with Omega 3’s, you’ll get a good does of Omega 3’s as well. I made two batches of these today and they were so good — definitely cookies I’ll make again and again. But what I did notice was that they were not so great hot. Let them cool completely before tasting because the structure changes a bit. Oooh, these are right up my alley. I’m always looking to increase my protein intake, especially post-workout. And the peanut butter really seals the deal in my mind. 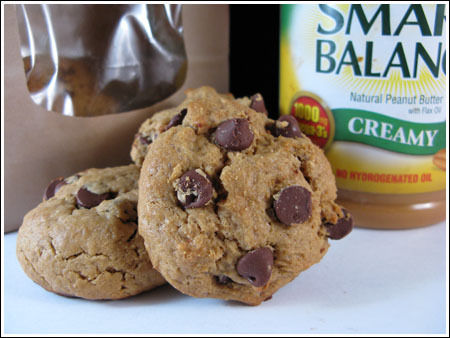 Made these today, used soy protein, they are awesome! I love them. Ooops. Sorry to write a book, there! About the soy flour. I used it in a gluten free biscotti recipe and it was pretty good. Great idea about using soy flour to up the protein. I’m going to look into that. It sounds like you made a new recipe! Swapping more butter for applesauce, deleting the egg in place of egg substitute, adding, milk, subtracting 2 tablespoons of turbinado sugar (thus diminishing the mass by about an ounce) would definitely change the results. Also, by elminating an ounce of a solid ingredient like sugar(something that accounts for structure), you’ve automatically increased the proportion of salt so it would make sense that yours would taste salty. That being said, mine are on the high end of salty, so if one is sensitive to salt, they might like the cookies with 1/4 teaspoon. I’ll note that. But I can’t really compare the texture of the recipe above with yours because of the changes you made. However, it’s always good to try new things and I commend you for being adventurous. Just for kicks, you might want to try making the recipe as written with no changes, then we can compare notes and see if there’s really a problem with the recipe. I made it as written above twice and the cookies are great! I know you’d like them if I gave you one and you probably wouldn’t even mind the salt. However, if you and/or other people make the recipe as written and it tastes bad or they don’t like the texture, than I need to make changes. I made these last night with whey protein powder – they came out really soft and cakey. Did yours have a normal dense cookie texture? I made a couple changes – used 1 tbsp butter and 1 extra tbsp applesauce, 3 tbsp egg substitute and 1 tbsp milk to help them spread more (they did spread nicely), 3 tbsp turbinado and 2 tbsp splenda and 6 tbsp choc chips instead of 1/2 cup. Mine also tasted too salty and I did use unsalted butter. On another note, have you ever used soy flour? You can use it in place of about 1/4 the flour in most non-yeast risen recipes with little taste/texture impact. It has 14 grams protein in 1/4 cup. I like using it better than protein powder as it doesn’t give it that weird gummy/rubbery texture that protein powder can. I actually buy it at my normal grocery store. You could use the Smart Balance 50/50 instead of the butter and get even more omegas. Those look so good! I can’t wait to hear a report from someone who cuts the sugar. I didn’t find these too sweet with the 5 tablespoons of sugar and molasses and I don’t usually like things too sweet. Plus, the sugar offsets the fat from the peanut butter and butter so everything seems in balance. I do think using a sweeter peanut butter like Jif or regular Skippy would make the cookies sweeter, so one option might be to cut the sugar by a tablespoon (or even 2) and use a sweeter peanut butter. One thing I’m concerned about is that the cookies might spread even less with less sugar. It’s a simple recipe, so it won’t take much to find out! I’m with Lisa in sugar reduction but other than that, these look like great high-protein snacks. This is a great recipe and I can’t wait to try it. I’ll reduce the sugar quite a bit and replace it with some non-bitter stevia. I’ve found that baked goods must have some sugar for texture and taste, but it can be reduced considerably and the end result will still work out fine. If you’re leery of buying a whole canister of protein powder because you don’t know what you’d do with the rest of it here’s an idea. I use mine in fruit smoothies. It really helps me get the protein I’m supposed to eat daily. I buy vanilla whey protein powder without added sugar or sugar substitutes. Katrina, the best way to start buying protein powder is to just get a couple of scoops from the bulk bin. But if you do end up buying a whole canister, I’m sure you’ll find a use for it. CL, I hope your recovery goes well. Sue, yes it is. Hopefully Mastercook is accurate! Sara, the only thing I don’t like about it is the sugar. I could reduce that, but I think I’d lose the qualities that make the cookie worth eating. you could really push these cookies over the edge into health-food status if you added some Fiber Sure (and it adds no texture or taste). That’s a good amount of protein for cookies! Sounds and looks yummy! I’ve never bought protein before, but have wanted to. Maybe it will take a cookie to get me to do it!